world class big band with 16 members on that small stage, a monday night institution. the witty host attracts broadway stars on their night off, along with up and comers. “Some of New York’s best known “deal holidays,” including NYC Restaurant Week and NYC Broadway Week, are joining forces this winter to create, wait for it… NYC Winter Outing. From January 21 to February 10, NYC Broadway Week, NYC Restaurant Week and NYC Must-See Week will all be running simultaneously offering full nights out for drastically reduced rates. During this time, a selection of Broadway shows, museums, attractions and tours will be available at two-for-one prices and almost 400 restaurants across the city will be offering prix-fixe menus. As in previous years, that means $26 prix-fix lunches and $42, three-course dinners. Enjoy The Lodge by Urbanspace, and The Rink, the centerpiece of Winter Village and New York City’s only free admission ice skating rink. This 17,000 square foot rink features free admission ice skating, high quality rental skates, and free skating shows, special events, and activities. 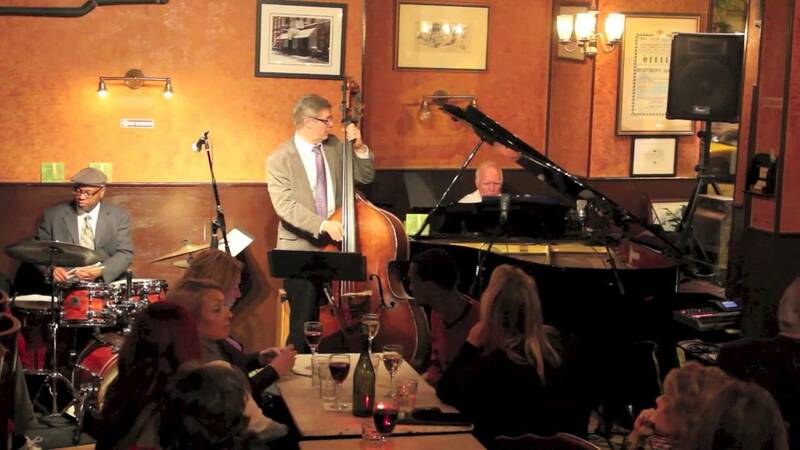 a classic, old jazz club in the Village, Caffe V often surprises with a wonderfully eclectic lineup. It’s my favorite spot for an evening of listening discovery and enjoyment. Each night Ishrat, the long time proprietor and impresario, carefully curates and schedules an eclectic series of musicians. You can often see him at his table in the corner, hard at work reviewing music videos and listening to cd demos on his laptop, scouting out future bookings. Musicians come from all over to play and sing in a club in Greenwich Village. Some are local New Yorkers, others are just passing through, in town for a few days. There is a small bar, seating maybe 10. It’s close to the stage and I find it’s a perfect spot to sip a glass of red wine while listening to the music. The room itself has the performance area at one end and a cozy fireplace at the other. The performance area here is small, dominated by a large black Yamaha Grand piano. Tables are bunched together and most people at the tables are eating lite meals or sampling the wonderful desserts. There is also a good selection of fairly priced wines, but you are here because of the music. You can never be quite sure what you’re going to find, and that’s half the charm of this place. It’s not a home run every night, but many nights it’s pretty special. I remember the night I saw the most talented bossa nova group, just in from San Paulo. As I listened, I wondered if there was any better music playing anywhere else in New York City that night. And at Caffé Vivaldi there is never a cover charge. Their recently redesigned web site does give you a better idea of the type of music playing each night. At one time Greenwich Village was filled with clubs just like this, but times change. Real estate interests have impacted the village, and not for the better. Even Caffé Vivaldi had a rough time recently, when a new landlord raised the rent exorbitantly. Fortunately, Ishrat has built a loyal following over the years, and a fund raiser and slightly more reasonable rent has kept Café Vivaldi in business. When Woody Allen and Al Pacino wanted to make movies featuring the timeless quality of Greenwich Village they came to Vivaldi. It’s important that we keep this special place alive, for if we lose Cafe Vivaldi, NYCity will have lost a piece of it’s soul. CAFFE VIVALDI HAS CLOSED, VERY SAD. I HAVE LEFT THIS REVIEW ON MY SITE AS A KIND OF MEMORIAL. “Caffe Vivaldi, one of the last bohemian bastions of the West Village, is set to close this weekend. During its 35 years on Jones Street, the casual cafe won the hearts of locals and celebs alike, including Oscar Isaac, Bette Midler, and Al Pacino. Subway: #1 to Christopher St. Walk 1 blk S. on 7th ave S. to Bleecker St., 1 blk left on Bleecker to Jones St., 50 yards left on Jones St. to Caffe V.
“Pub” is used in it’s broadest sense – bars, bar/restaurants, jazz clubs, wine bars, tapas bars, craft beer bars, dive bars, cocktail lounges, and of course, pubs – just about anyplace you can get a drink without a cover charge. It’s not difficult to find a place to eat in Manhattan. Finding a good, inexpensive place to eat is a bit harder. This was an easy pick – the best raw bar special in town. $9 gets you 6 of the freshest oysters or clams + a glass of wine or beer. Don’t know how they can do it, but I tell everyone I know about this place. And it’s located right in the heart of some of the best no cover music in town. The place is tiny and not much to look at, but this is one good slice. They like to brag that they have been voted “Best pizza in NY” 3 years in a row by the Food Network. I believe them. I would have voted for them. This is a Cambodian banh mi sandwich shop that kept me well fed while I was in class nearby recently. It’s cramped, even for NYCity, but usually there is room up the spiral staircase to sit down and eat. In good weather carry your sandwich a few blocks to Union Square park. You may have to wait a few minutes, because everything is freshly made, but it’s worth it. Can you believe – an unheard of 26 food rating by Zagat. NYCity is the most diverse and interesting place to find a meal anywhere in the world. With more than 24,000 eating establishments you might welcome some advice. “Eating and Drinking on NYCity’s WestSide” ($4.99, available SUMMER 2019). ◊ Order before AUG. 31, 2019 and receive a bonus – 27 of my favorite casual dining places with free Wi-Fi. This entry was posted in Uncategorized and tagged ‘IOLANTA’ AND ‘BLUEBEARD’S CASTLE’, Exploring Ethical Dilemmas In Journalism, How the President and the FBI Have Been Portrayed in Fictional Films, Jim Caruso’s Cast Party, Juilliard Songfest, NYC Events, NYC Events Today, Rhett Miller w/ Jeff Slate. Bookmark the permalink.